Evening view of the Harkness Memorial Tower and the Collegiate Gothic Memorial Quadrangle complex at Yale University in New Haven, Connecticut. 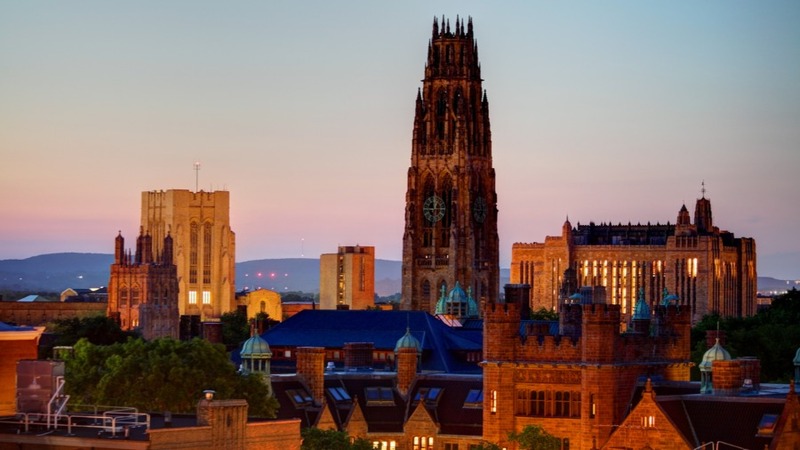 Yale Women's Soccer Head Coach Rudy Meredith was caught in an FBI sting uncovering a widespread college admissions scandal. News broke this week of the biggest college admissions scandal in history. William Singer, a college admissions consultant based in Newport Beach, CA, is at the center of an elaborate system in which rich parents paid top dollar for bumped-up SAT scores, fake athletic credentials, and more. There was even a fake charity set up to funnel the dirty money: Meaning you could bribe the right officials and take a tax write-off. What a deal! The scope of individuals charged with crimes is impressive and terrifying. Who’s next? Highly respected and accomplished coaches were bribed. Folks whose jobs it is to ensure the integrity of the SAT were rigging the system to line their pockets. At least one senior athletic department administrator has been fired (USC). Where does it end? And why is anyone willing to pay $1.2 million dollars to say their kid is a star soccer recruit at Yale? Bottom line: Getting in is now a total crapshoot. Plenty of equally qualified students get rejected. Everyone knows this. So why pay $1.2 million to secure admissions to Yale? Then he came to the States and met a Harvard grad. Gladwell goes on to summarize the history of Harvard’s admissions. Harvard is the leader the other elites have followed, so he might as well be talking about the whole lot. Long story short, Harvard started looking at the “personal qualities” of applicants about a century ago. The goal was to limit Jewish enrollment. Over the next 50 years the admissions formula would become increasingly complex. Athletes would be afforded lower standards. After all, it’s good for a school’s image to compete well in sports. But the personal qualities rating would become the best predictor of admission. First it was Jewish people, now it’s Asians who are making a credible case that the cards are stacked against them. The market for elite universities has grown dramatically, both at home and among the wealthy and connected abroad. But the number of freshman seats at Harvard, Yale, Princeton and other such schools has remained constant. In the last two decades since my wife got into Stanford, the number of applicants competing for the same number of spots has more than tripled. Has the education gotten three times better? Of course not. Is the Payoff that Much Better? There’s the allure of prestige. Of excellence by association. On the part of students and parents in general — across the board, not just among the elite — there’s a greater desire for a credential than for the education the credential is intended to signify. If it’s about the diploma rather than the learning, why not get the supposedly best diploma money can buy? There’s the belief that Ivy Leaguers make far more money 10-20 years later. So these schools must have a special magic. But a study by economists Alan Krueger and Stacy Dale debunked this simplistic view. They found that students who achieved test scores and grades high enough to get into an elite university, but who choose a lesser ranked school, did just as well as their peers who attended the elite university. It’s the students — not the schools — that makes the difference. Sure, if Yale is full of talented, ambitious students, we’d expect them to do well in life. But their outcomes would have been equally positive had they done their undergraduates elsewhere. Curiously, Krueger and Stacy found one exception: Students from the lowest socioeconomic classes did better if they went to the elite schools. The theory is that these students were more needful of getting into a high-achieving environment than others. Any low-income families caught up in Operation Varsity Blues? Nope. 1. Cheaters often get caught. Let’s hope this proves to be a deterrent. 2. Where you go to college is not nearly as important as what you do when you’re there, and thereafter. If the best thing you can say about yourself is that you got into Yale, you have a sad life. 4. In fact, being among the top students at your college is uniquely valuable. You get more attention from faculty. Scholarships and internships more readily come your way. It’s not an accident that many of my graduate school peers at U.C. Berkeley had, like me, done their undergraduates at no-name schools. So work hard, play by the rules, and trust God. Stanford or Samford, it’ll work out just fine. Dr. Alex Chediak (Ph.D., U.C. Berkeley) is a professor and the author of Thriving at College (Tyndale House, 2011), a roadmap for how students can best navigate the challenges of their college years. His latest book is Beating the College Debt Trap. Learn more about him at www.alexchediak.com or follow him on Twitter (@chediak). Bribe College Admissions Officers? My Parents Wouldn’t Pay for Driver’s Ed.